It's hard to tell just how imperilled killer whales are. With several different forms—some of which may even be different species—it's unclear which are at serious risk and which are less vulnerable. But one group is definitely in jeopardy. 'The southern resident killer whale population was listed as endangered in the United States in 2005', says Jennifer Tennessen from the National Oceanic and Atmospheric Administration (NOAA), USA and the decline of Chinook salmon in the Pacific Northwest—which are consumed by the population of ~75 whales—is believed to be one of the causes. While shipping also poses a risk to the animals, NOAA has been monitoring them for a decade and one of the scientists' main goals was to estimate how much fish the charismatic whales capture. But, with the majority of pursuits occurring beneath the waves, Tennessen and her colleagues needed to develop a technique based on the animals' manoeuvres that would allow them to identify when the mammals were successful. They publish their discovery that killer whale hunts are not always successful and that male killer whales hunt more than females in Journal of Experimental Biology. Heading into the Salish Sea, between Vancouver Island, British Columbia and Washington State, Tennessen and her colleagues—Marla Holt, Candice Emmons, Brad Hanson, Jeff Hogan and Deborah Giles—attached tags to 21 whales to record their sounds and underwater movements. Then the team followed the animals, noting where they surfaced and what they were up to, in addition to retrieving the remains of any meals. 'Fieldwork is one of the most exciting yet simultaneously challenging aspects of the research', says Tennessen, describing how she and her colleagues tracked the animals from small inflatable boats in all conditions. Safely back on shore, Tennessen and Holt began looking for patterns in the movement recordings that correlated with the tell-tale echolocation clicks produced by the whales when closing in on a fish. 'Once a fish has been detected, the killer whale angles its body steeply downward, begins a descent to depths of about 50-300m, and then remains underwater for about 7-10min while pursuing the fish', says Tennessen, adding that they abruptly roll on their sides and change direction frequently during a pursuit. Incorporating details of these signature manoeuvres into a computer program, Tennessen and Holt were able to identify successfully 126 occasions when the killer whales intercepted a tasty fish. However, when the team categorised all of the deep dives that they had recorded, they were surprised that some of the dives were unsuccessful and Tennessen explains that this was unexpected, 'because diving deep costs significant energy and it was thought that the payoff was a captured fish'. The team also compared the number of successful hunts, according to their movement signatures, with how often they observed the killer whales dining at the surface and discovered that some of the animals appear to consume their prey before reaching the surface; 'underscoring...that surface observations alone can misrepresent the actual number of fish being captured', says Tennessen. Most surprisingly, the team realised that the males were diving more than the females and that they were more successful. '[This] suggests that males may need to forage more in order to meet their greater metabolic needs', she says. 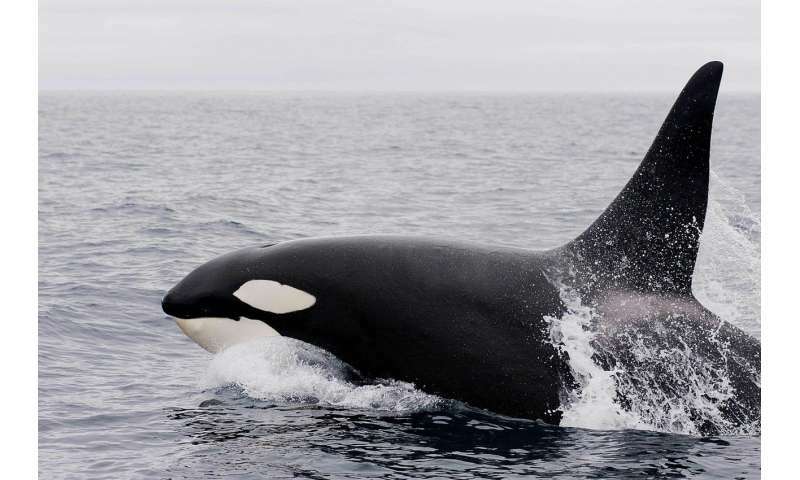 So male and female killer whales are not equal when it comes to hunting and now the team is eager to find out how the noise generated by shipping and other vessels affects the enigmatic mammals while searching for salmon beneath the waves. Are these humpback whales too close for comfort?